"Standing Up" is a feature length documentary following three unlikely aspiring comedians who are risking everything to find their voice in the cutthroat NYC comedy scene. 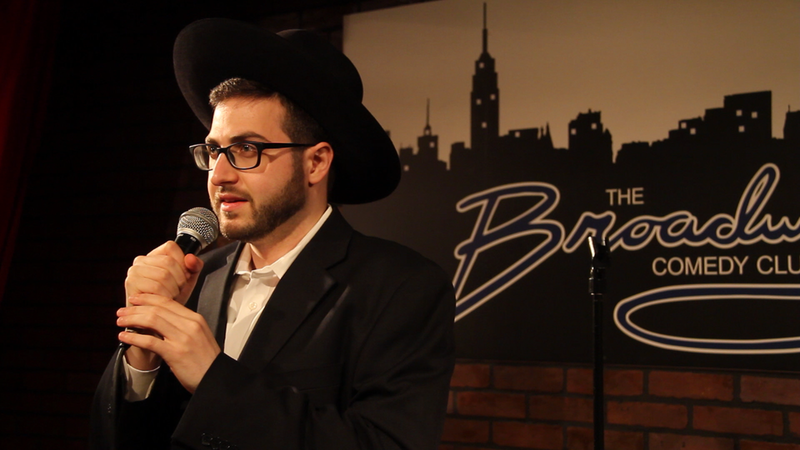 David Finkelstein is an ultra-Orthodox Jew who dreams of being the next Louis C.K. Although he risks expulsion from his community with every show, David lives for his daily ten minutes of stage time. He’s forced to juggle two irreconcilable worlds, knowing he must eventually make a decision. Sara Parks quit a lucrative job to chase her life-long dream in New York, only to find herself alone and penniless. On the verge of homelessness, Sara is under incredible pressure to break into the comedy scene before it breaks her. Raafat Toss is a wealthy personal injury lawyer who would give it all away for a chance at the spotlight. With his first child on the way, Raafat seizes the moment to do what he's always been afraid to: pursue a comedy career. From David’s first show at a gay bar, to Raafat getting heckled out of his first open mic, to Sara unexpectedly finding love, Standing Up captures both the exhilarating highs and the darkest moments of their journeys. As their love of comedy is tested again and again, each must ultimately decide just how far they’re willing to go — and how much they’re willing to sacrifice — for a laugh.